Morning We start our tour at Sultan Qaboos Grand Mosque, a magnificent architectural complex. Its furnishings are the grandest you will find anywhere in the region. Our next point of interestand the highlight of the tour, is the visit to the Perfume factory �Amouage�. Founded over a quarter of a century ago,We then drive to Al Bustan street with its gorgeous trees and continue to Muttrah. Here we proceed on foot, walking around the Al Alam Palace, ancient Mirani and Jelali forts. 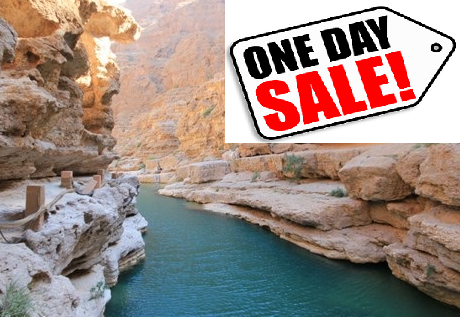 morning ,Wadi Shab is a canyon type valley with flowing water throughout the year. Through the Coast from Muscat to Quriyat and over the plateau Travel down and Reach Wadi Shab. First you will enjoy your long walk through the green grass, mango and banana trees along the narrow winding .have your Picnic Lunch after the long walk, then a series of streams and pools can be reached through old rock paths. After wading and swimming through some gentle ponds your extreme adventure begins.